Hey shop owners. Welcome to yet another addition of Car Count Daily. My name’s Ron Ipach, but you can call me Captain Car Count, because that’s all I’ve done over the past 20 years is specialize in helping auto repair shop owners just like you to get and then keep all the top quality customers that your shop can handle. 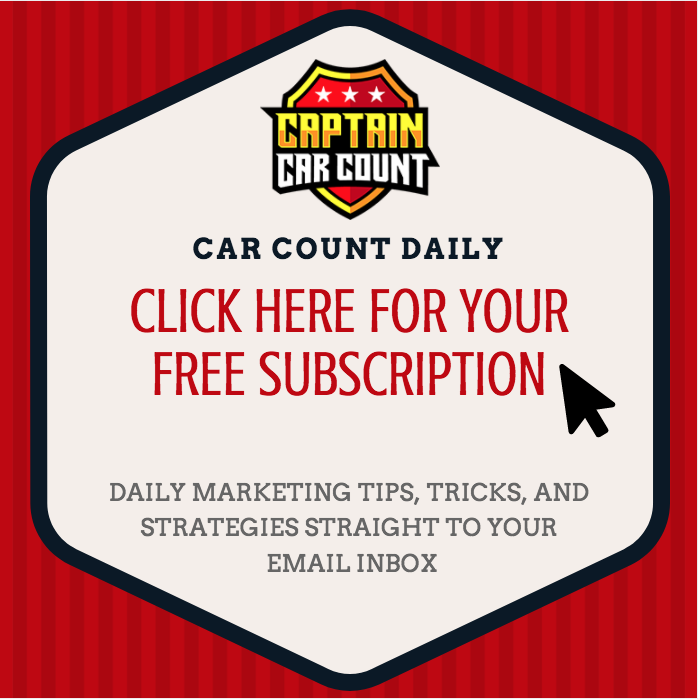 If you were with us on yesterday’s Car Count Daily you know that this week is going to be a five part series on how to use video just like you’re watching right now to market your business. 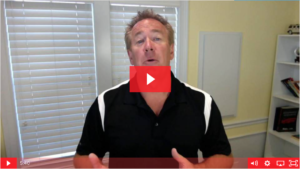 Yesterday I talked about the importance of using video and why it’s going to help convert better and get you more customers. If you haven’t yet seen that please go back and watch yesterday’s video as soon as you’re finished with today’s video. Today is video number two. Video number two, as I promised yesterday, is going to be all about the equipment that you’re going to need to record your video. As I mentioned yesterday, chances are you already have it. You’ve already got it so you don’t have to invest a lot of money, or any money at all in some cases, to get your video recorded. What’s the best thing that you can do to record the video? I record my videos for Captain Car Count and the Car Count Daily on this amazing device. It’s something, maybe you’ve never heard of it before, but it’s called a mobile phone. Most of my videos that I’m doing I’m recording using this simple, I’m using an iPad, or an iPhone, but you can use an iPad if you’ve got an Android. As long as it’s got a video camera on there you can use that, and especially the newer versions. What I mean by newer, anything within the last maybe five years or three years of smartphones, has an amazing camera already built in, so that’s good enough. That’s good enough to get your vide out there. I’m recording this right now actually on the camera that’s attached to my iMac computer, so I’m just using a regular, the camera that’s this big. A little tiny thing that’s built into my computer. That’s what you’re watching right now. As you can see the quality is pretty darn good, that’s already on your computer or already in your phone so you don’t have to buy any expensive equipment. If you’re going to do a video where you’re walking through your shop it’s obviously going to be a whole lot easier to carry one of these with you than it is a whole desktop computer or a laptop, but it can be done. I’ve seen people do that before, so you don’t have to worry about buying an inexpensive camera. You already own a great camera that’s going to do the job for you. The next thing you’re going to need is light. If you don’t have good lighting you’re going to appear really dark, so it’s important that you have enough light in the room. If your shop is well lit chances are you have enough light. If it’s kind of dimly lit and you don’t have it, you’re going to need some sort of a light source. Either record it in the front part of your office or go outside in the daylight and let mother nature provide all the light that you need. You can use natural light, you can use the lights that are in the ceiling, or worse comes to worse, depending on where it is, you’re going to need some sort of a lighting source. I’m going to show right here, I’m using my light in the video. It costs maybe $25 to use and it gives a lot of light. It lights my face as you can kind of see. It gives a really nice glow. It makes me look a whole lot better than I actually am by the way. Regardless, you need to have some sort of light and be sure that you don’t have lights on behind you. All the light needs to come from the front because let me just show you something. Let me just open up this. You see what that did to me? All that light that’s behind me now is, you can barely see me. All I have to do is just close and here I am again. You kind of see how it changes a little bit. I didn’t do anything to the filters. It’s just all the light needs to be coming from the front. Either use mother nature, and if you’re outside and it’s a really sunny day you might find maybe a little more of a shaded area so you don’t have all that direct light on you. That would be probably a little bit better, but natural light. Mother nature provides that for you probably at least 12 hours a day, depending on where you’re at. Enough light to get a really good lighting source, but if you’re going to be inside use regular lighting or go get some inexpensive lights for $25-$35, so that’s what you need. The final thing is a microphone. You need to be heard. If you’re going to use, let’s say for example, and iPhone. If I’m walking around outside, you’ve probably seen some videos like that where I’m walking outside, I’m just simply holding out the iPhone like this. If you notice I’m holding it in the video because the microphone on my particular iPhone, an iPhone 7, is located sort of on the back. It’s actually on the bottom, so I kind of cup my hand around there. I’m not covering up the microphone so that as I’m talking the sound kind of bounces in there. That tends to be good enough. If it’s not good enough then you might want to just get an inexpensive lapel microphone, and I show a picture on the screen of what I use occasionally depending on where I’m going to be shooting the video and how much extra noise is around me. Sometimes I just need to have a microphone that I wear. It’s very inexpensive. It just plugs right into the bottom of that. You need some sort of a microphone. The microphone on, at least I know on the iPhone, is plenty good enough. If you’re in a noisy area make sure you have a different one. I’m using on my desktop I have this thing, it’s called a blue snowball. You can probably tell I’m doing it because you can … That’s the microphone that I’m using. It’s not that expensive. This I got several years ago and it works phenomenal. That’s what you’re hearing right now. You need to have some sort of a way to capture your voice. If you’re going to be shooting in a noisy shop you’re definitely are going to need some sort of microphone that’s closer to you that only picks up the sound that’s coming out of your mouth and not everything else around. I shot a video just yesterday where I was walking construction was happening with me and I was outside walking with my iPhone and I had that lapel microphone. You barely heard anything on the microphone even though it was pretty loud where I was at. That’s because it’s a microphone that’s designed to just pickup what’s right there in front. That’s really the only things you need. You need a camera, which you probably already own. You need some sort of light source, which mother nature provides that, or there’s probably some in the ceilings that you have. Then you need a microphone, which again, your iPhone or your Android already has a mic in there, but depending on the situation you may need to just do something a little different so you capture the sound. Passed that, that’s it. That’s all you need in order to be able to record the video. That’s the equipment you need. Now next up, tomorrow we’re going to talk about what you’re going to talk about on this video because you’re probably wondering shooting a video’s great. What the heck am I going to talk about? We’re going to cover that in tomorrow’s video. I will see you then. I’m really enjoying putting this series together. This is the second of the five videos. I will see you on Car Count Daily tomorrow where we talk all about what the heck to talk about on your brand new videos that you’re going to shoot. Thank you for this information. It is helpful to know I already have what I need to do video (just my I-phone), and now I am looking forward to your video tomorrow to learn about what to record. You are addressing a real stumbling block for people. Thank you again for this useful information. These are really great tips. We invested in a professional video clip for our website, but shops certainly don’t need to invest that kind of money every time for these types of infomercials. Keep up the good work Ron. I’ll keep doing the videos as long you keep watching! You’ll be surprised at the quality you’ll get from just using a mobile phone, a mic, and good lighting!